With most food eating challenges, you don’t get any options in regards to what you want to eat. The restaurant has already preselected what each customer must consume in order to win their challenge. Most restaurants don’t even really allow substitutions. What is specified on the menu is what you will get, and there are no ifs, ands, or buts about it. This particularly pertains to the main entree of the challenge, such as the burger in the burger challenge and the sandwich in the sandwich challenge. There are not many, but there are some food challenges where you are allowed to pick which side item(s) you want to eat with your main entree. 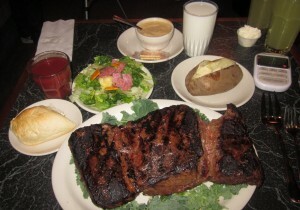 For an example of a challenge with preselected side items, The Big Texan’s 72 ounce Steak Challenge requires that you finish a baked potato, side salad, roll, and order of shrimp cocktail along with the 72 ounce steak. There are no substitutions, and you cannot get mashed potatoes instead of a baked potato. For an example of a challenge where you can choose your side items, Steak & Main’s Great Steak Challenge allows you to pick two 8oz side items to go along with your over 74 ounces of delicious steak. You can get mashed potatoes, a baked potato, corn, green beans, and a few other options. You can even get a double portion of the same thing, such as two orders of mashed potatoes. There are other food challenges too where you are allowed to pick from options such as french fries, coleslaw, onion rings, tater tots, and fresh veggies. The purpose of this article is to help explain which side items are the easiest to consume that you should pick to eat as part of your challenge. 1. Side Salad w/ Dressing – Most side salads are very basic and extremely light, consisting mostly of lettuce, shredded cheese, and a few other simple vegetables. Salad is not the easiest to eat quickly, but the dressing you choose will help make make the lettuce easier to swallow faster than you would be able to without dressing. Overall, a side salad may take a few extra seconds to eat, but it is usually the lightest option available on the menu which is what you need so that you have enough stomach space to finish the entree & rest of your meal. 2. Mixed Veggies (Corn, Green Beans, & Carrots) – Mixed vegetables, including corn, green beans, and carrots, are typically served straight out of a can and heated up so that they are watery and very easy to eat without much chewing. This point also includes having corn, green beans, or carrots as alone options without anything mixed in. For example, you may be able to just order a side of corn, or you may be able to get a side order of green beans. These are easier to eat than the steamed vegetables below because they are smaller and not nearly as crisp and chewy. Most restaurants will only serve a few scoops at most which will be light and easy to eat. 3. Steamed Veggies (Broccoli & Cauliflower) / Fresh Fruit – Some restaurants serve fresh steamed veggies as a side option, typically including broccoli, squash, cauliflower, and baby carrots (much bigger than those served with mixed veggies). They are usually cooked in a light butter sauce. Some restaurants have fresh fruit available too which typically includes watermelon, honeydew melon, pineapple, strawberries, and grapes. These options will also be very light, and typically come in small servings, but require more chewing than canned vegetables. 4. Soup / Baked Beans / Chili / Cottage Cheese – These options are more dense than the three options above, but they will most likely be just as easy to eat, if not even easier. Soup, baked beans, chili, and cottage cheese have more expensive food costs associated with them, and they are usually served in small portions as side items. You will get a lot less baked beans than you would french fries. These somewhat depend on the restaurant and how chunky the items are, but they should be smaller than the options below, and much easier to eat since they are all very creamy. You may even want to dip your other foods in these to reduce your need for extra liquid. 5. Mashed Potatoes (Buttered, Seasoned, or w/ Gravy) – Mashed potatoes are by far the best potato option to choose because they barely require any chewing, if at all. They may come buttered, seasoned, topped with gravy, or even loaded with cheese, bacon, and sour cream, but you should be able to consume mashed potatoes very quickly and efficiently. More often than not, about the same amount of potatoes will be used as you would receive by ordering fries or a baked potato, but mashed potatoes are creamy and so much easier to eat. They will be even easier to eat if they are covered with gravy, butter, or sauce. You can finish them and move on to other tougher items. If you have this option during a steak challenge, you may want to dip your steak pieces in the mashed potatoes because the creaminess will help you swallow faster without needing to drink extra liquid. 6. Macaroni Salad / Pasta Salad / Potato Salad / Coleslaw – These four options are typically much chunkier and chewier than mashed potatoes, chili, soup, cottage cheese, and baked beans. Their thickness and creaminess mostly depend on the restaurant serving them, but they should be easy and simple to chew and swallow. Use a large utensil, take big bites, and let the creaminess of each side item help slide the food down your throat so that you can move on to the next bite. Most servings of these items are small compared to the amount of fries you would receive, since they have a much higher food cost associated with them. Which option you choose mostly depends on your taste buds and texture preference since they all have about the same difficulty level. 7. Bread / Roll / Texas Toast – Rolls, Texas Toast, and other bread items are typically specified as required sides in the challenges that they are included with, rather than as options to choose from. If they are an option for you and your challenge though, they would be #7 on the list. Rolls are tougher to chew and swallow than the creamy and moist items above, but they are much easier to consume than the potato and fried items below on this list. 8. Baked Potato / Baked Sweet Potato / Baked Red Potatoes – Properly cooked regular, sweet, and red baked potatoes are moist and “tender” which make them much easier to consume than all of the fried items below. They are the next best potato option to choose, second of course to creamy mashed potatoes. If you have the option, get your baked potato plain without any sour cream or butter, and then you can just pick it up and eat it like a piece of fruit. You will be able to eat it much faster and easier than you would by using a knife and fork. The butter and sour cream will soak in to the potato and help moisten it further, but that benefit is negated by the added messiness and necessity to eat it with utensils. Sweet potatoes are typically softer than regular potatoes and sometimes smaller too, but the choice mostly just depends on which option you prefer. Some restaurants serve twice baked potatoes too as an option. If can choose between a regular potato and twice baked potato, choose a regular potato and save yourself from the extra toppings added in, but a twice baked potato is still a much better option than the fried choices below. One major benefit of choosing a baked potato is that a baked potato is a baked potato. It is not weighed or measured, and the restaurant cannot add an extra scoop or portion to make the challenge harder for you. They may pick the biggest one available, but they could do much more damage to your chances of winning by secretly adding a few extra scoops of mashed potatoes. 9. Steak Fries / Chips (British) / Potato Wedges / Sweet Potato Fries – When it comes to fries, remember that thicker is almost always better!! Thicker steak fries (called “chips” in Great Britain) and potato wedges are usually much more moist than thinner fries which makes them easier to chew and swallow. Because they are more moist and filled with grease and juices, they are much more dense and heavier, so you typically receive much less than you would of thinner french fries. This is especially true if the restaurant weighs them on a scale before adding them to your plate. Since they are thicker, they have a much smaller ratio of surface area to mass which makes them less crispy than all of the thinner fries below. Follow our How To Get Your French Fries Cooked article and you should be happy with how “tender” these items are. Sweet potato fries are usually the same thickness as regular fries, but sweet potatoes are much softer typically than regular potatoes, so sweet potato fries are very tender and just as easy to consume as steak fries and potato wedges, if not even easier. 10. French Fries / Onion Rings – Hand-cut (fresh-cut) french fries, onion rings, and regular (frozen) french fries are next on the list. They are thinner than the fries mentioned above which gives them a higher ratio of surface area to mass, making them more crispy and tougher to eat. Fresh-cut fries are typically softer and easier to eat than frozen french fries, but no restaurant will ever give you that option. They either serve one or the other. Onion rings and french fries have a pretty similar difficulty level both when they are warm and when they get cold towards the end of your challenge. I prefer onion rings over french fries but that is mostly my taste buds speaking. Onion rings have a much higher surface area to mass ratio than french fries but onion rings typically break apart much easier which makes them able to be eaten more efficiently. If you have the option between onion rings and french fries, ask your server how they portion them. If they are weighed, you may want to pick french fries because you will have to eat less. If the chef just grabs a few handfuls, you may want to choose onion rings because they are lighter, more spaced out, and much larger due to the massive hole in the middle. You may want to ask whether the onion rings are homemade or frozen too. Homemade french fries are easier to consume than frozen, but frozen rings are typically lighter, thinner, and easier to eat than homemade ones. 11. Tater Tots / Crinkle Cut Fries – Tater tots and crinkle cut fries are typically tougher to consume than regular french fries and onion rings because they have a higher surface area to mass ratio, making them crispier and tougher to chew. Perfectly cooked tater tots can sometimes be easy to consume, but they get tougher to eat as they cool down. Crinkle cut fries get harder and tougher to chew as they cool down too. To some people, tater tots may be included in the same difficulty category as french fries and onion rings up above, but I placed them here based on previous experiences. I have found that both french fries and onion rings are easier to eat than crispy tater tots, and more enjoyable too when they are cooled off. Crinkle cut fries are typically much more greasy and definitely more crunchy than regular french fries, and are therefore placed below them on the list. 12. Curly Fries / Waffle Fries – Curly fries and waffle fries have the absolute highest surface area to mass ratio of all fried potato options. They are light, airy, chewy, and very crispy which makes them much tougher to eat quickly and efficiently. These options typically require a lot more extra liquid to help chew and swallow them down your throat. Whether they are seasoned or not, that does not make much difference on their difficulty level, and only your taste buds. If your fries are weighed, you are almost guaranteed to have to eat more curly or waffle fries than you would regular fries because they are so much lighter and less dense than normal fries. These are the toughest and least favorable side you can choose in regards to helping you win your challenge. Hopefully now you have a basic knowledge and understanding of which options you should choose during your next food challenge that allows you to pick your side items. If all of the options you have are not specifically mentioned on this list, please use common sense to figure out where exactly each one should be placed. For example, corn on the cob would be placed under #3 since it is fresh and not canned corn. If you are doing a German food challenge and have to eat sauerkraut, it would be placed under #6. If you are required to choose one potato side item, just use the rankings on this list to help you decide. Creamy mashed potatoes at #5 would obviously be a better choice than curly fries at #12. If you have any questions or comments about this list, feel free to comment below or contact us. Please note that the side item you choose also depends on your stomach capacity vs the challenge you are attempting. If you know that you will be able to finish the challenge no matter what option you choose, and that you really don’t care whether you set a record or not, you are free to choose based on taste rather than difficulty level. For more tips to help increase your stomach capacity, click here. Thanks for reading about the best sides to order for food challenges and using FoodChallenges.com! !